Do you – like most people – tend to head out to lunch each workday to a restaurant, or to the company cafeteria? If you do, you may want to take a fresh look at brown-bagging your lunch. It can open up a few options that can improve your workday, even apart from the fact that it can also save you some money. The typical workplace today is a more stressful environment that it was just a few years ago. While it may be possible to take a break from it by having lunch with your coworkers, either in the cafeteria or in a restaurant, oftentimes the best way to seriously recharge yourself is by spending some time alone. Think of it as “me time” during the workday. A solitary lunch can be the perfect way to de-stress from the day, particularly if you’re going through a period at work that is especially busy, or if you are experiencing conflict with someone in the office. Sometimes just being able to step out to take a breather for a half an hour or an hour, can help you to put everything into perspective, to organize your thoughts, and to deal with the challenges that the second half of the day might bring. Though we typically prefer to compartmentalize our lives, with a routine such as eight hours of continuous sleep, and eight hours of continuous work, that’s not always the optimal mix for our bodies. Sometimes a cat nap in the middle of the day helps you gain the energy that you need to be more productive in the afternoon. If you’ve ever begun to experience fatigue sometime around the middle of the afternoon, it may be that your eight hour spell of sleep last night is beginning to wear off. A 20 or 30 minute nap during your lunch break could help to avoid that kind of fatigue. That has the potential to improve your performance, particularly late in the day when some of your coworkers start to become less productive. In addition, it may provide you with the extra sleep you need to make the most of your evenings. At the opposite end of the spectrum, your lunch break can also be an excellent time to get some exercise. A brisk walk in a local park, or even at an enclosed shopping mall, could get your blood flowing, and improve your energy level in much the same way that a nap will. It’s also often true that sometimes you do your best thinking while exercising. The faster functioning of your body also tends to improve the performance of your mind. That work related problem that you were wrestling with all morning may be solved by the time you get back to the office, as a result of having taken a walk at lunchtime. One of the problems with heading out of the office to grab lunch at a restaurant is that it involves fighting the noonday traffic. If you work in an area with a high concentration of offices, this problem can be particularly significant. Just getting to a fast food restaurant to get a sandwich or a burger can be as intense as the morning or evening rush hour. The last thing you need on your lunch hour is to be sitting in heavy traffic. Not only does it cut down on the amount of time that you have actually relaxing with your lunch, but it also adds stress at a time of the day when you should be experiencing calm and quiet. While it may seem that you have more control over your food choices when you eat at a restaurant, or even the company cafeteria, the opposite is often closer to the truth. Restaurants and cafeterias usually offer limited selection menus, and those selections are primarily restricted to the food they sell the most of. If that happens be burgers, pizza, and greasy fries, those will be your options. Since the most healthy meals are both prepared and consumed in the home, brown-bagging your lunch will represent an extension of this process. You’ll be able to take time to make the right nutritional choices, and to have them available while you’re at work and on a limited time budget. If you go out to lunch with a group of coworkers, you’re probably already aware of how lunch sessions can easily turn into gossip mills. One of the ways that people blow off steam at the office is by complaining about bosses, coworkers, and working conditions over lunch. While it’s true that this does help to relieve stress, there’s also a fine line between legitimate criticism and exaggerated personal attacks. By brown-bagging your lunch, and eating alone as frequently as possible, you avoid putting yourself in a position to both be exposed to these sessions, and worse, to participate in them. It’s not inconceivable that an over-the-top comment spoken in confidence over lunch could lead to the loss of your job. When people are ranting, the targets of their attacks change frequently. Just because someone is sympathetic to you today, doesn’t mean that they might not see you as an enemy at some point the future. 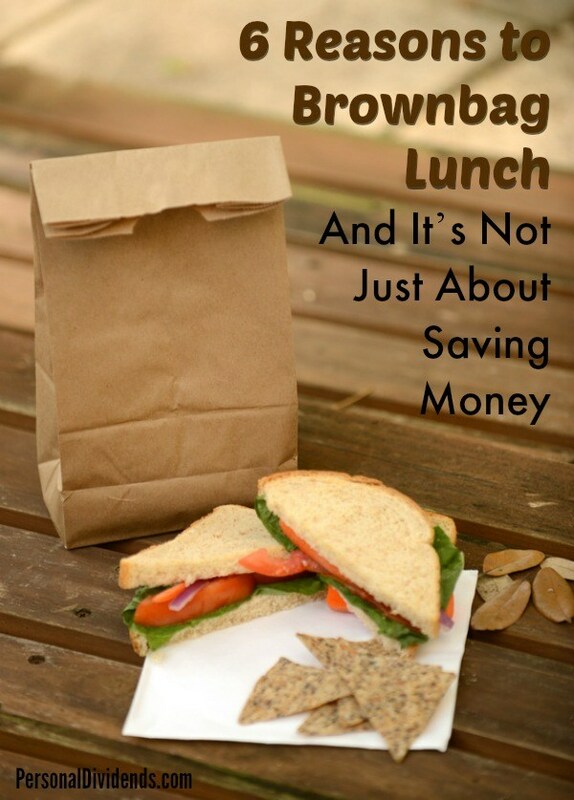 Overall, brown-bagging your lunch will give you greater control over your workday. You should use this to your advantage, so that you are in a position to choose what you’ll do each day, rather than being dependent upon the office crowd.